Explore our various high quality utility and hunting knives. On the go and outdoors. We have your blade covered. Join our no-hassle rewards club today for 10% off your entire purchase. The controlled-angle sharpening system was designed by Arthur Lansky Levine in 1979. A first of its kind, the knife sharpening system was a hit with consumers, and remains our most popular item. The Lansky controlled-angle knife sharpening system is an easy-to-use sharpening solution that helps you get a razor sharp edge every time. It comes in seven kit varieties, with three to five sharpening hones per kit. Looking to Supplement Your Kit? Looking to supplement your kit with an additional sharpening hone or leather strop? Visit our parts & accessories page. In addition to our controlled-angle sharpening systems, Lansky also offers a variety of pocket sharpeners for use in the field or at home, kitchen knife sharpeners to tackle your chef’s knives and other kitchen cutlery, and sharpeners for the various tools around your home. Get your chisels sharp with a diamond paddle, or touch up your axe with The Puck. Whatever you need to sharpen, Lansky has the tool for the job. Choose from various sharpening abrasives including: alumina oxide, diamond, tungsten carbide, ceramic, and natural Arkansas. Sharpener styles include: pull-through sharpeners for quick repairs and touch-ups, turn boxes with 5 inch or 9 inch rods, bench stones, controlled-angle sharpening kits, butcher’s rod styles, and more. 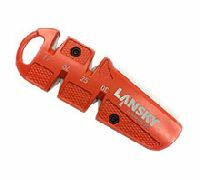 Lansky Sharpeners: providing quality knife sharpening systems since 1979.